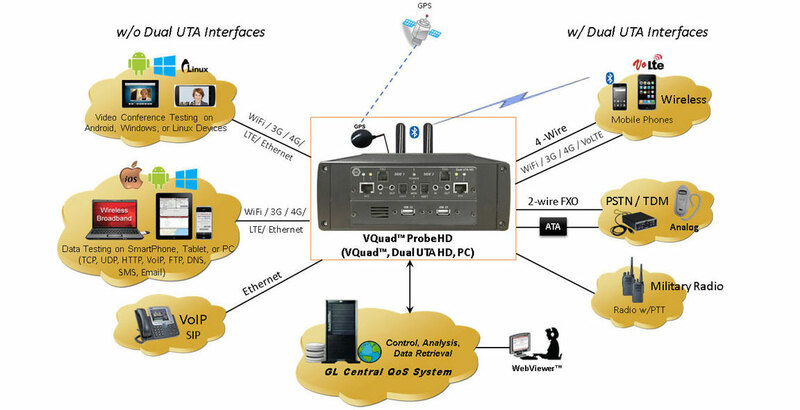 enhanced stand-alone and automated Voice, Data and Video Testing probe referred to as VQuad™ Probe. He added, “The VQuad™ Probe is relatively small, 8.3” x 7.4” x 3” high (210mm x 188mm x 76mm), so it is unobtrusive when left onsite or running in a lab. There is a Dual UTA within the VQuad™ Probe which supports up to two independent tests or a single bi-directional test. Up to three additional Dual UTAs can be connected to the VQuad™ Probe, via USB, for a maximum capacity of 8 independent devices. Mr. Bichefsky explained, “The VQuad™ Probe can be used for intrusive Voice Quality Testing, using the POLQA (ITU-P.863) or PESQ (ITU-P.862) algorithms. Using any of the supported interfaces, after a connection is established, the VQuad™ Probe can send audio in one direction while recording audio in the opposite direction. The recorded audio files are transferred to the GL VQT software for analysis against POLQA or PESQ. All results, including MOS, Signal/Noise Level Gain and Jitter, are transferred to the central database. The GL's VQT solution is fully automated and can be remotely controlled via CLI. A single instance of VQT, located at a central system, can support all VQuad™ Probes within the network (no need to purchase multiple instances of VQT). VQuad™ NetTest, for testing/analyzing data communication within any network, supports testing directly from the VQuad™ Probe as well as testing from any Mobile Device (requires free downloadable app for Android and IOS). Both the PC and Mobile Device testing supports the following: TCP, UDP (capacity), VoIP, HTTP, FTP, and DNS. Mobile devices also include SMS, Email, RSSI, Battery Level, and Cell Site informational tests. Tests can be run directly from the Mobile device or from a VQuad™ script for automated operation. All results are sent to the central database.